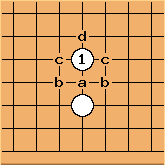 is the one-point jump into the center, combining attack and defense. It gives White running room, while separating and placing pressure on Black stones on either side. Common in running fights, the one-point jump moves out quickly (see getting ahead with a one-point jump), but is potentially vulnerable to being cut depending on the surrounding position (see cutting the one-point jump). It is also subject to the peeps at b. According to the proverb, the one-point jump is never a bad move. the two-point jump at d, which moves out even faster but is that much weaker. .